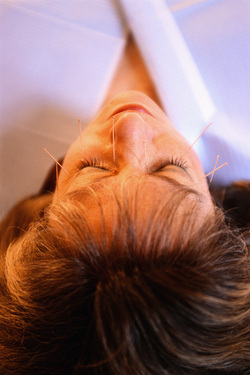 Call and book your 15 minutes free consultation to see if cosmetic acupuncture is right for you. The treatment itself involves the insertion of very fine facial acupuncture needles into specific points on the head and face, with body points added to correlate with your individual needs. Each treatment takes about 50 minutes, with the needles left in place for about 25-30 minutes. During this time you relax in one of our comfortable treatment rooms with lights dimmed and soft music playing for a total relaxation experience. A standard course of treatment is 10 individual sessions, ideally to be completed in succession of once or twice per week as your schedule allows (therefore 5 to 10 weeks of treatment). For your first time, it is recommended to opt for the standard set of 10 treatments for best results, and results are often noticed within the first 4 treatments. To help determine if Facial Rejuvenation Acupuncture is right for you, take advantage of our free 15 minute, no obligation consultation. During this visit, any questions you may have will be answered face-to-face. Rebecca Stephens, Dr.TCM, R.Ac. B.Sc. “I had been interested in facial acupuncture for some time and was delighted to see it available at Healing Cedar Wellness. I booked 10 sessions and saw results after pretty much my first one. My skin looks healthier and fresher, the fine lines around my eyes have all but gone, my breakouts have disappeared and I have had so many people asking me if I have been on vacation as I look so relaxed. In addition to the way I look - the benefits to my health and well being have been awesome - the treatment takes away the feelings I had with the daily stresses in my life, any headaches I had are no more and I feel so much more relaxed.